In order to convince Canadian consumers that new Pantene Anti-Breakage Shampoo is all it's cracked up to be, Pantene delivered a guerrilla campaign that made people stop and take note. Pantene hung long braids from the windows of buildings throughout Toronto. 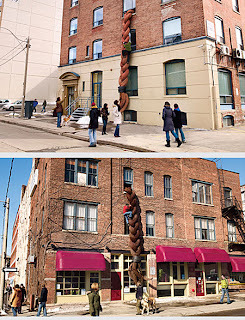 Perched on the top of the braid hung a man climbing to reach his Rapunzel. The message? Pantene's new Anti-Breakage Shampoo is so strong you could climb on it. I would give Pantene a solid A for breaking through the clutter, while simultaneously slamming home their single-minded message.